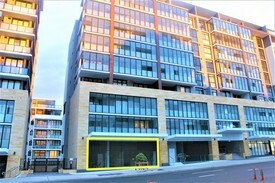 2 Commercial Real Estate & Properties in Arncliffe are listed in 1 categories. We have 2 Retail ShopsSale . Gunning Real Estate is pleased to present this brand new shop for sale. Located right on the busy Princes Highway, the propertey is within 300 metres from Arncliffe train station. The property features an open plan area and a spacious partitioned room. It is also fitted out with brand new floor&wall tiles and kitchenette (ceilings to be finished shortly). KEY FEATURES: Floor area: 75sqm Two (2) allocated car spaces 11m wide frontage Brand new fit out Own kitchenette Common toilets Access to grease trap, exhaust, and gas in building 3 phase power High ceiling (4.24m) Great natural light Signage opportunity Occupy or invest All figures stated above are approximate. Please contact William Wu 吴劭东 (0450 250 123) and William Gunning (0413 610 194) for further information or inspection.